ProMach offers extensive experience handling a wide range of flexible packaging products in diverse conditions - many of the world's most successful brands are packaged by ProMach flexible solutions. 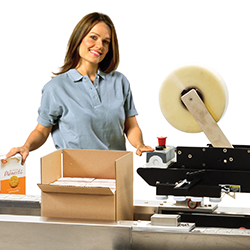 Accuracy, speed, and efficiency: ProMach is recognized across the globe as a leading, single-source supplier for high-quality labeling, coding, and marking systems for primary and secondary packaging. What is the Texwrap Difference? Shrink Wrapping or Shrink Bundling? Sustainability is growing in importance in all industry sectors. 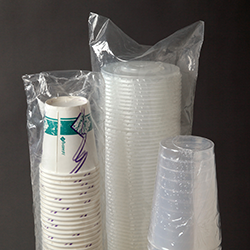 The packaging industry is no exception, considering its high usage of plastic and paper materials. Along with the need for increasingly higher process efficiency and throughput volumes, sustainability has become a much higher profile component in packaging machinery, and more so is being considered a critical factor in the design and selection of packaging equipment. The major emphasis with sustainable processes in packaging machinery is directed to the reduction of environmental impact by: a) decreasing consumption of raw materials and increasing the utilization of more recycled materials; b) reducing energy usage in packaging processes while increasing machine efficiency; and c) optimizing packaging to facilitate a better usage of cubic-volume space, resulting in a more efficient use of transportation in shipping. Embracing process sustainability in the packaging industry is automated shrink wrapping, which has made significant strides in achieving sustainability objectives. 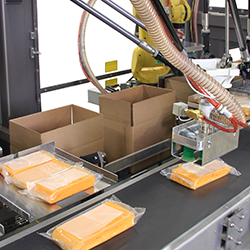 Shrink wrapping of products has seen significant improvements in automation over the past decade, commensurate with increases in computing capability of PLC controls, improved performance of servo-driven motors, and streamlined high-speed camera technology. Combined, these have enabled precise product and film control, which allows high-speed wrapping with precision print registration. The result is fast, reliable and flexible shrink wrapping, with minimal moving parts, reduced maintenance, and maximum uptime performance, while using the least amount of film possible. The throughput speed of shrink wrappers is achieved by the performance of the sealing head. In conventional shrink-wrapping systems, a box-motion is performed by the sealing head. This refers to the rectangular-shaped path of the sealing head, in which the device making the end-seal moves horizontally with the product as the seal is being made. When the seal is complete, the head raises and the carriage returns to engage the next package and make the next seal. The box seal executes rapid movements back and forth and requires a large and heavy carriage assembly to mount the sealer. This creates considerable inertia, requiring significant force to stop the carriage in its forward and backwards motions. Bumpers are typically used to provide hard stops for the sealer carriage, causing shaking that usually occurs on the fast returns, forcing the system to pause while the photo eyes and sensors settle out. Speed of cycle time is compromised with this type of reciprocating motion. Depending on the package size, there are times when the head sealer cannot get back into position in time for the next seal. One of the latest and most pivotal technologies to impact the performance of automated shrink wrapping is servo-orbital-motion sealing head technology, which was developed by Texwrap Packaging Systems. This patented technology eliminates the need for the head to move horizontally with the product while the seal is being made. The orbital sealing head moves in an ellipse, always in the same direction, eliminating any back-and-forth motion by the sealing carriage, thereby dramatically increasing the throughput speed of the wrapper. 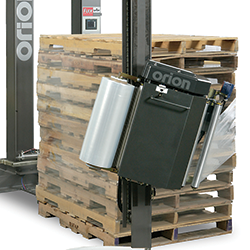 One of the latest and most pivotal technologies to impact the performance of automated shrink wrapping is servo-orbital-motion sealing head technology. Flexibility of film selection and economy of film usage are important benefits of this new generation of automated shrink wrapping technology. Ensuring consistent, high-quality seals across a wide range of film types and gauges, like polyethylene and polyolefin films, is critical for ease of operation, better system uptime, and minimal maintenance and film waste. Supporting this is an automated system for side-seal wrappers, called Versa Seal™, which provides exceptional control over the three elements necessary for a good seal – pressure, temperature and time. This system enables fewer film roll changes, and less scrap or trim per package. Manufacturers are converting more of their product packaging to the use of shrink wrap, and away from the use of corrugated. The demand for shrink wrapping has particularly grown in sustainable applications as a way to reduce the amount of packaging material needed, and to minimize shipping cube space. When the same amount of products can be shipped in less cubic space this reduces the need for transportation and the subsequent effects on the environment. Quite additionally, shrink wrapping keeps products clean and dry, and adds a measure of tamper resistance, which supports product safety for food, RX and OTC drugs, and hospital and laboratory supplies. But shrink wrapping has really come into prominence with the packaging of multi-packs. Combining multiple items in a singular shrink-wrapped multipack package has considerable benefits for manufacturers, retailers and consumers throughout the entire supply chain. The demand for shrink wrapping multipacks has particularly grown in application as a way to reduce the amount of packaging material needed, both to cut packaging costs and to better achieve sustainability initiatives. Film waste and corrugated reduction, advanced technology for improved process controls and throughput efficiency – these are key factors that have escalated shrink wrapping into a preferred packaging technology. They are also critical functions for achieving sustainable practices in packaging by reducing environmental impacts. Packexpo 2018: One of the latest and most pivotal technologies to impact the performance of automated shrink wrapping is servo-orbital-motion sealing head technology. Texwrap manufactures a full line of automatic standard and custom shrink wrapping systems, including shrink wrappers, shrink bundlers, L-bar sealers, side sealers, tunnels, infeed solutions, and conveyors. Come work with us! We are always looking for great talent to join our teams.